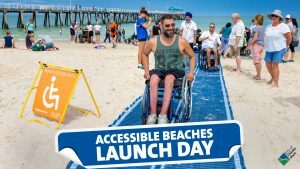 The City Of Charles Sturt, Accessible Beaches and Push Mobility rolled out the Summer Season of the Henley Beach accessible beach mats for the first time early in December 2018. Subject to weather and other factors the mat will be rolled out, just North of Jetty, each week from Thursday – Sunday each week during Summer. Contact City of Charles Sturt for details ongoing Accessible Beach days, or go here.